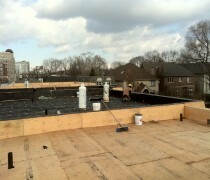 Dillon Bros. Roofing is proud to offer a wide range of flat roofing membranes. From the classic 2 ply modified bitumen to the more advanced single ply TPO and EPDM systems that can be fully adhered or mechanically fastened. We are fully licensed by IKO, SOPREMA, CARLISLE and FIRESTONE.